Now with importing pages from other learning objects and also a brand new results page! On behalf of the Xerte developer community we are pleased to announce the official release of the latest version of our software: Xerte Online Toolkits 3.5. 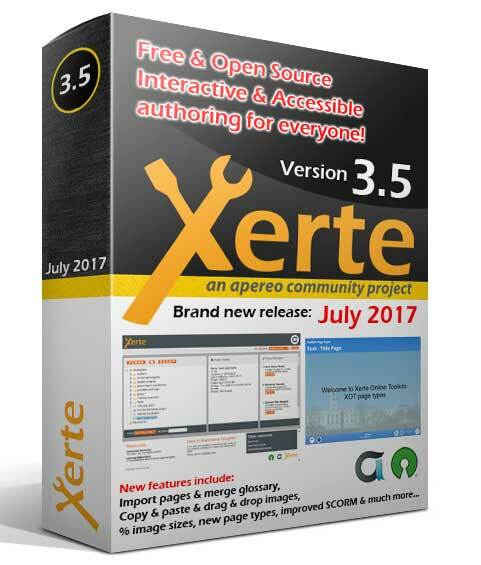 The Xerte Online Toolkits 3.5 release brings many new features and functionality as well as bug fixes and other improvements. We have summarised many of the new features in the attached release notes. Click on the pdf icon to view/download. 1. Via the Xerte community website in the forum "Wish List". These requirements are then reviewed and possibly developed when one or more members of the community see this as useful and viable and of course if/when there is time. 2. You can also make a donation which would be very much appreciated. These donations are used to maintain Xerte and develop new functionality. Click here to make your donation via PayPal. 4. Join our developer community and contribute directly to developments and improvements. The Xerte Community is a volunteer-based organization. Please help us to continue that!